Dr. Gray has a multifaceted career in which she has built programs to drive biomedical technology innovation, conducted research to better understand and prevent osteoarthritis, led a preeminent academic unit, and served the profession through work with organizations and institutions. Trained in computer science and electrical and biomedical engineering, and serving as an MIT faculty for nearly three decades, Dr. Gray has held numerous leadership positions. 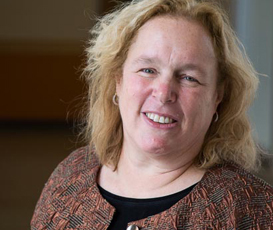 For 13+ years, she directed the Harvard-MIT Division of Health Sciences and Technology (HST), an academic unit with multiple research and training programs for careers in medicine, business, and research. Dr Gray currently directs two multi-institutional MIT ventures, the IMPACT program and the M+Vision Consortium, that focus on accelerating and deepening early-career researchers’ potential for impact. Over the course of these efforts, she and her team developed a principled methodology for needs identification and opportunity development. Her earlier research centered on ways to nondestructively visualize cartilage macromolecules in vivo and in vitro. Many in industry and academia are now using the MR method developed by her group, known as dGEMRIC. Dr. Gray was the first woman to lead a science or engineering department at MIT. She is an elected fellow of the AAAS, the Biomedical Engineering Society (BMES), and the American Institute of Medical and Biological Engineers (AIMBE). She is associate editor of the Annual Reviews of Biomedical Engineering. Her training includes a BS in computer sciences from Michigan State University, an MS in electrical engineering from MIT, and a PhD in medical engineering from HST. Dr. Gray completed her postdoctoral work at Tufts University and the State University of New York Stony Brook. Professor Gray’s current research builds on her experience directing HST and aims to establish validated approaches to accelerate biomedical technology innovation. Through a novel approach to research development that engages young talent and a diverse group of stakeholders from the academic, medical, and business sectors, she has spearheaded the development of numerous projects that have produced intellectual property flow at more than twice the volume and pace normally seen by MIT’s technology licensing office, brought numerous researchers into new areas, and attracted follow on funding through public and private sources. Her extensive prior research was geared towards understanding and, ultimately preventing or slowing, the cartilage degeneration that affects at least 6 out of 10 people over age 45. Over the last decade, the efforts of Professor Gray and her colleagues have been primarily directed at establishing MRI tools that provide a picture of the biochemical and functional properties of the tissue. Specifically, they have developed and verified a method called dGEMRIC that indicates the amount of glycosaminoglycan (GAG) in the tissue. Regions of tissue that are functionally inadequate can be distinguished from normal tissue even when the entire tissue is anatomically intact (and looks normal with the usual imaging methods). They have also demonstrated that this imaging method can be used clinically (in vivo in humans) and for basic science studies of cartilage development. She and her colleagues have also shown that differences in GAG correspond with differences in mechanical (functional) tissue properties. This method is now available on musculoskeletal packages for MR systems and is used by numerous research groups around the world. M. L. Gray, F. Eckstein, C. Peterfy, L. Dahlberg, Y. J. Kim, and A. G. Sorensen. “Toward Imaging Biomarkers for Osteoarthritis.” Clinical Orthopaedics and Related Research 427S (2004): 175-81. Y. J. Kim, D. Jaramillo, M. B. Millis, M. L. Gray, and D. Burstein. “Assessment of Early Osteoarthritis in Hip Dysplasia with Delayed Gadolinium-Enhanced MRI of Cartilage.” The Journal of Bone and Joint Surgery 85-A.10 (2003): 1987-92. M. L. Gray, and J. Bonventre. “Training PhD researchers to translate science to clinical medicine: Closing the gap from the other side.” Nature Medicine 8 (2002): 433-36.